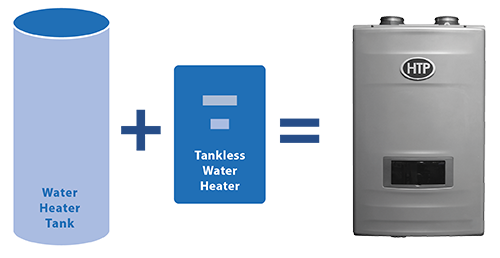 We are excited to announce a new high efficiency hybrid water heater – the Crossover. The Crossover incorporates the best of both worlds in one unit with its tank and tankless components. The result is one appliance that exceeds all of your hot water needs. This new unit provides endless hot water, has a built in recirculation pump, and requires no minimum flow rate. The Crossover has a 10:1 turndown ratio and is available in both liquid propane and natural gas. It has a 96.5% thermal efficiency rating and is made with the highest quality materials, including an advanced hi-fin 316L heat exchanger designed for superior performance. This wall mounted unit is eco-friendly with a low NOx combustion system and built in leak detectors for gas and water.